BUCYRUS — The Ohio Highway Patrol is asking motorists to help keep their fellow drivers and law enforcement officers safe by following Ohio’s “Move Over” law. From 2012-2016, Ohio State Highway Patrol cruisers were involved in 73 crashes that appear be related to the move over law. These crashes resulted in deaths of two civilians, 24 injured officers and 32 injured civilians. According to the FBI, from 2006 to 2015, 93 law enforcement officers across the United States were struck by vehicles and killed while working. Alcohol and/or drugs played a role in 19 percent of move over crashes, and wet roads or those covered in snow or ice accounted for 59 percent of these crashes. The vast majority of crashes, 82 percent, occurred on interstate, US and state routes. 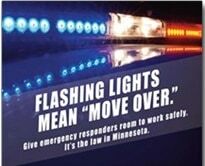 Troopers wrote 12,179 citations for violations of the move over law from 2012 – 2016.